Manitouwadge And Atikokan: A Return To Where I Grew Up! My father was a mining engineer and that meant you usually would end up working in a small town. In our case my dad started his early career in Atikokan at the Steep Rock mine and then moved our family to Manitouwadge to work for Noranda at their GECO mine. My sister moved to Toronto as a teenager to attend university and ended up staying there for her career. Recently on a visit for her to Thunder Bay we took driving trips back to both of these towns to see where we grew up again and how these towns were progressing. Our first destination was Manitouwadge which is about 250 miles from Thunder Bay, some 30 miles off the Transcanada Highway. My first impression driving there was how good the roads are today. The route from Thunder Bay to Nipigon is seeing a great transformation. The views to Marathon are spectacular and the Hwy 614 to Manitouwadge has been completely repaved and is excellent! It was fun to see the downtown of Manitouwadge and visit a old friend, Theo Gionet. The golf course looked great, similar to when my father was involved in it’s creation in 1975. 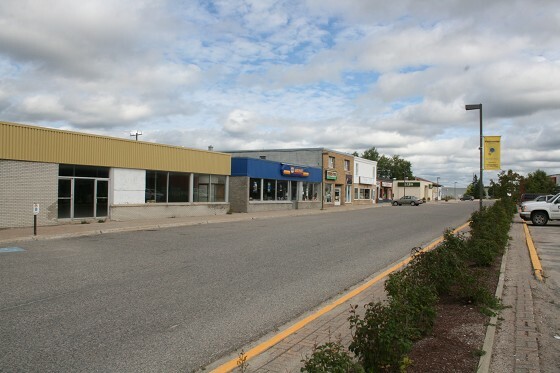 In 2014 Manitouwadge has a lot to offer in terms of lifestyle and quality of life. There are still very reasonable houses for sale, eg $12,000 and many recreation opportunities including snowmobiling, ATV, fishing, hunting, golf, skiing- the list goes on. They have 3 full time residents doctors and a modern hospital. You could create a pretty nice life in Manitouwadge. Our next trip was to Atikokan, about 2 hours west of Thunder Bay. Again the highway there was pretty good and the last section appeared to be under construction. One of our first stops was at the old elementary school we attended which now is the home of the Pierces! Yes they have converted this 7500 square foot school to their home. We also saw our original home on Spring Street which was undergoing an expansion renovation. “ Also Resolute is building a lumber mill in Sapawe a few kilometers from here with 90 direct jobs as well as those people who harvest and haul wood. Both Resolute and Rentech each have a contract for 45,000 cubic meters of biomass per year each. Resolute is building a pellet plant in Thunder Bay. It was fun returning to towns where I grew up. What struck me the most on these trip was how nice and sincere the people in these small towns are- it was a great place to grow up!